Because I've received so many E-mails on my Purple Martin Page about natural gourds and how to either, acquire them, raise them or prepare them for purple martins, that I've decided to create a page just for gourds. 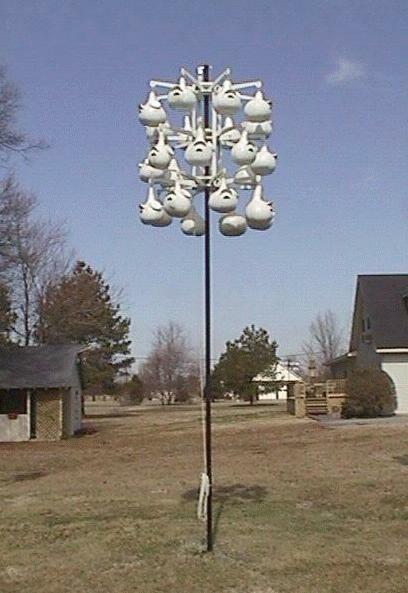 Now, I knew that other people used gourds for purple martins besides me, but I didn't realize they were so popular. Therefore, I'll try to put as much information here as I can so everyone will have a clear understanding about them. To accomplish this, I will use information from other web sites, excerpts from books and/or pamphlets along with first hand knowledge from myself and/or others that grow them. First, I'd like to make one thing clear. I'm no expert and don't proclaim to be. However, I have grown a lot of gourds, know a little bit about them and use them primarily in my martin site. I just seemed to have better results with gourds than any other kind of housing in my area. May I also add, most of the general growing and handling information contained here will work for just about any gourd species, but the specific martin information is going to pertain to gourds used for housing purple martins. In my case, they are of the Lagenaria family. If you're growing other kinds and want more information, there are many other pages that have information on gourds for other purposes. A few are displayed below, plus The American Gourd Society can be contacted through the address and phone number given further down this page. In these pages, I will try and answer all questions pertaining to gourds to be used for purple martins or bird nesting in general. If you have questions about other uses or the artistic values of gourds, please contact some of the folks below. That is their thing and they will be able to answer your questions much better than I will. And if you check out a few of their links, you'll quickly understand why. There is a lot of talent in this world, and some of it is displayed in the gourd links below. The gourd family covers a broad spectrum of vined plants. It ranges from the edible kind, such as pumpkins, squash and cucumbers all the way through the inedible kind such as, well, hard-shelled gourds. That's the kind of gourds we're going to concentrate on. The dictionary describes these hard-shelled versions as: "any of various hard-rinded inedible fruits of plants of two genera (Lagenaria and Cucurbita) often used for ornaments or for vessels and utensils." Gourds are used for a number of different reasons depending on the type you have. Some are small and colorful with all kinds of weird and interesting shapes and usually used for ornamental purposes. These are usually a soft shelled gourd and you often see these in little ornamental baskets for decorations. Some are intermediate sized and are used for bowls, pots, jugs and drinking vessels. These are often the favorites for artisans and are used for artistic purposes and most of the artistic crafts. You'll see a lot of these at gourd and craft shows. Then there's the larger sized that are basically used for birds houses. These are the bottle gourds and are the kind we're interested in. 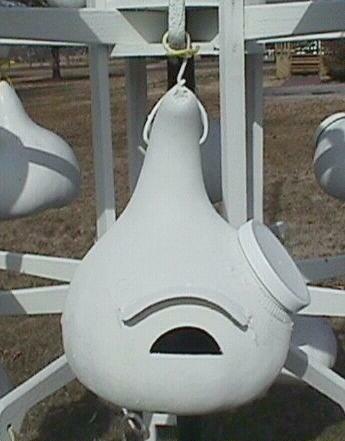 They are often called "bird house gourds", because that's what the early Indians used them for. They discovered that if they cut holes in them, cleaned them out and hung them in trees or on poles around their gardens, birds would use them as a nesting site. 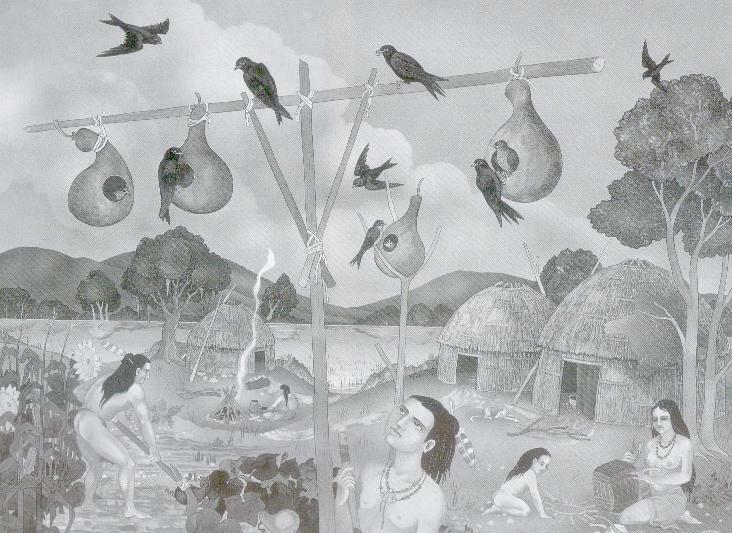 They quickly found that, as they put more of them up, if they could get a certain kind of bird to use them, the insect population around the general village declined. As the purple martins discovered the gourds, they left the holes in the trees and assumed the gourds as living quarters. Because the constant commotion around the gardens kept other birds away from the gourds, the martins soon learned that being around man was beneficial to them. Man supplied them with nesting sites, kept other birds away from the gourds and they had places to rear their young, thus, the beginning of a long and happy relationship between man and the purple martin. For those that are interested in the artistic side of gourds, the following are a few links that will get you started. Some of these links show just how creative people can be so if art is your bag, check them out. They'll have other links that'll get you to where you want to go. Here's the link to The American Gourd Society. If you've neither the time, nor the room to grow your own martin gourds, but would like to acquire some for your own use, then you can buy them. All you have to do is find them, and just about everybody knows somebody else that grows gourds. If you live anywhere near an Amish Settlement, they almost always have gourds of all kinds for sale. 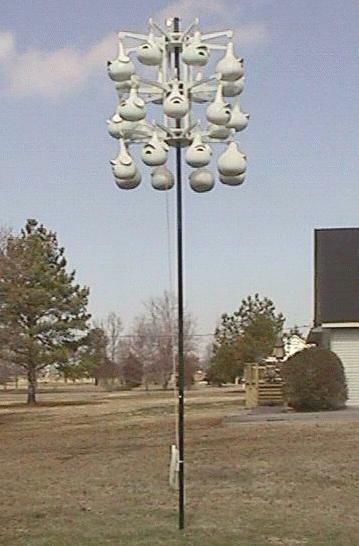 They also use gourds for purple martins. Often, some craft shops and/or garden shops will know of someone that raises them. If all your efforts fail to locate any, then you can contact the Purple Martin Conservation Association and they will sell you some. You can get their catalog with all kinds of items you can acquire for purple martins, including gourds. They are already cleaned, drilled and ready to be treated, painted and hung. Since the original idea of this page is to tie purple martins and gourds together, the rest of this page will primarily concern itself with easy to build and inexpensive housing for martins. Housing that is light, easy to work with and in just about anybody's' price range and best of all, it will attract purple martins. And of course, it will consist of gourds. But, before we get into raising purple martins in gourds, if you are not totally familiar with the rules for attracting and keeping purple martins and if you have not already done so, I suggest you take a look at my purple martin page. It has a lot more details about martins that are not on this page and may answer a few questions that you might have about keeping them. There's one thing said there that I'd like to reiterate here and that's the location of any purple martin site. It should have a lot of landing room. Martins like to swoop into their nests, and if there are any tall trees or other hindering obstructions close by, it's going to be very difficult for the house to attract them. No structures of any kind taller than the martin house should be within 60 feet of the site. They just won't come. However, this does not apply to 'human' housing. It can be as close as 30 feet as long as it isn't taller than the martin housing. Before erecting your site, think about a location for the site where there will be no hindrances for the martins when they approach the site. Things like tall buildings and trees give an ambushing hawk the advantage and martins don't like it and therefore, won't nest in such conditions. Martins like to sit on phone wires, but if those wires are in the flight path to their nests, they now become a hindrance, thus a possible deterrence to martins nesting in your site. May not seem like much, but sometimes that's all it takes to make or break a site. However, if the martins decide that you have a good site location, then they will readily settle in and take up residence. If you plan to supply gourds for martin housing, one of the things that will have to be considered is HOW you plan to offer them. There are many different options available ranging from long straight lines of gourds, ' T ' shaped poles, poles with metal wheels or old rake tines, and so on. I didn't really care for any of those so I decided to design my own. The system you see above is one that I designed and is one of four that are in my yard near my home. I developed it because I just wasn't happy with the other forms of poles that were available. The following is why I designed my own gourd rack. For years I'd tried to attract martins to my martin 'house' without success. They came, but never stayed. Then, a friend suggested that I put up some gourds and bingo, I had martins move in the first year. The gourds happened to be on a 'T' shaped pole that did not come down easily and therefore, maintenance was a very big problem. The pole was too high and I couldn't get at the gourds to take care of them. I even had some sparrows move into one of the other gourds, and I couldn't easily get to them to remove them. There just had to be a better way, so I went into my wood shop, sat down in the doorway and watched the birds and looked at the pole and thought about it. If I couldn't get up the pole to get to the gourds, why not bring the gourds down to me. Then and there, I decided to come up with a system where I could mount my gourds and yet, get at them easily to perform maintenance on them. At the same time I wanted them to be aesthetically appealing. I also designed in a pulley system that really makes the whole thing happen. The pulley system is a block and tackle design and will easily handle all the weight of the gourds and the martin materials inside the gourds. Thus, the system you see above. Normally, the design only contains two levels, but I had so many martins coming that I had to go to three levels. Yes, it's a little heavier, but the pulley system handles it easily. I now have 4 poles in my site, 2 with 3 layers of gourds as shown above (and below) and 2 with 2 layers as the design was originally intended. Now, I didn't come up with the idea of putting up gourds. I also didn't come up with the idea of raising and lowering them. I just refined it to suite my liking. The maintenance of the unit is quick and easy, while at the same time, low cost and what I think to be attractive. The unit is also easily accessible from any direction for the martins. 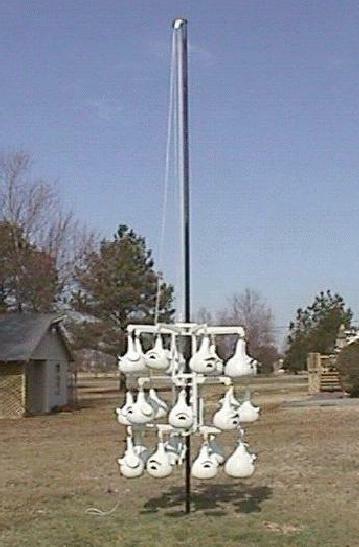 The system is lightweight but strong and will mount 16 gourds on 2 layers on a steel pole. It's very easy to care for. Everything to make the unit is readily available in your local lumber yard and hardware store, except the gourds, and they are usually available with a little inquiring around. In fact, here's some Gourd Suppliers. When you do order some, purchase a few extra, sometimes they need replacing and it's always good to have a few extras around. If you really get into it, and you have the room, you can keep a few seeds and grow them. As far as tools required to build the unit, all you will need is everyday hand tools the average person keeps around the house such as a jigsaw, drill, simple wrenches and pliers. The plans call for only 2 layers of gourds, but as you can see, a third can easily be added if you're strong enough to handle the extra weight. The unit will cost approximately $100.00 to build and set up. Since I grow my own gourds, that helps with the cost. The cost may vary depending on the area, the price of the materials for that area, and the amount of work you want to put into it.. I believe this cost is within the range of just about anyone who would be interested in attracting these delightful birds. And once you finally do get a colony started, it will be worth every minute of work and every penny you spent to just sit back and watch them as they effortlessly float through the air eating insects and thus making life a little better for you. If you want one, you can build one. What I've done is put together a small packet that explains all you need to know to build a two level Purple Martin slide system and mount it on a pole and start your own colony. All the instructions required to build and erect one of these units is contained in the packet. It includes a complete itemized list of materials, drawings and assembly procedures for assembling the entire unit, instructions how to put in a ground socket, put the pole up and how to attach the slide and gourds to it. There's even a few maintenance tips for the pole, gourds and wooden parts. If you like the way my system looks and your interested in putting one up and you don't mind helping pay for my computer time and copying costs, then send a check for $10.00, along with a Self Addressed #10 Envelope (Legal Size) with enough postage to cover 2 ounces on it to the address below and I'll send you the packet. Might I also add, this system is very light and can easily be raised and lowered by folks that may be slight in stature or maybe a little on the older side like me. There's no pinching of fingers like with telescoping poles. There's no tipping of the gourds like on poles that pivot to lower them for inspection. There's no climbing of ladder to get at the hard mounted systems thus making thing safer. If you'd like one, but for some reason, don't have the ability to make one, check with a friend that probably could do it for you. Most everyone knows someone that has a garage, a few basic tools and the know how to read basic drawings and build a basic structure like this. Depending on the skill level, it takes about one weekend to build one and assemble it. Painting depends on how long the paint takes to dry. One more thing. Just because you put up one of these poles is no guarantee that you're going to get a Purple Martin colony. (Although I'll give you better odds than if you tried to attract them to a house). There are rules that have to be followed to attract martins to new sites and the same goes for this structure also. It's young martins that overflow from other sites that usually start new colonies because the older established birds will return to the original house they nested in year after year, even the same nest if possible. It might take some time to get a colony established. This is something that's very hard to predict and sometimes, patience is a must. What you have to do is make the site as appealing as possible to the martins and if they like it, they will stay. Mine did. It is generally accepted that two nesting pair is considered a colony. Then, as long as there are nests available, some of the young will also return to the same area the following year, and maybe bring others with them, thus your colony will grow. All I can do is suggest you try it and see what happens. Who knows, you might get lucky too.